The adage “you can’t make a silk purse out of a sow’s ear” applies to all canine activities, but probably more to birddog work than to any other. Birddogs come in more “makes and models” and with more “optional extras” than any other type of sporting dog. Why? Apparently because birddog fanciers have a wider range of expectations than do spaniel or retriever fanciers. But no one birddog can do everything any given person might want. Some excel at one thing, others at other things. Thus, it matters little how great a trainer you may be; if you do not start out with the right dog you will fail to develop the kind of dog you have in mind—and you will waste an irreplaceable year or two of your life in the process. The term “right dog” has three dimensions: First, it should come from a breed known to operate in the manner the individual owner prefers—as, as indicated above, that varies widely; the dog must have inherited the proper instincts, which only come from proper breeding. Second, it should be properly bred from good working stock. Third, it should have a personality compatible to the boss. With that being said, let’s take a look at 10 of the more common pointing birddogs. 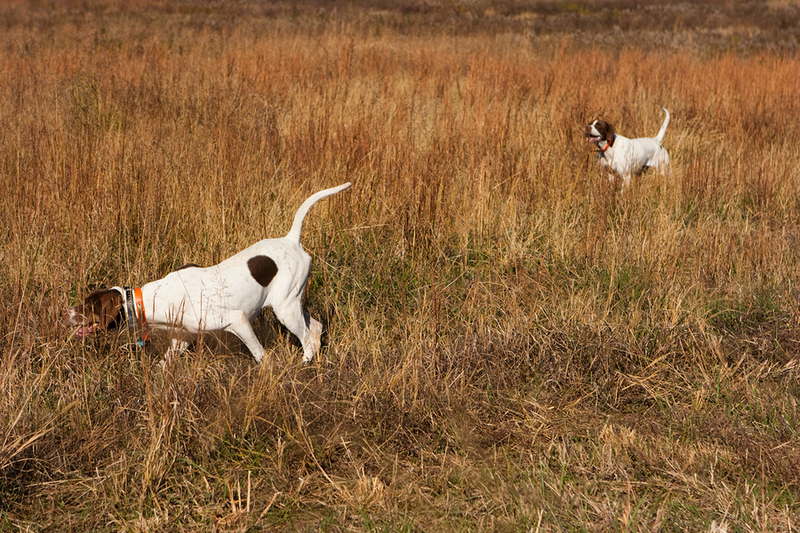 Pointer – Not your lap dog, the typical field-bred Pointers are aloof to their owners and have one mission in life: to find birds. He can be a real challenge to the trainer because of his aloofness. Getting his attention is difficult and once given, he can become strangely soft and sensitive or stubborn and pig-headed. Thus, a good trainer must be able to alternate between severity and gentleness in order to get the best out of the dog. Because of their field trial backgrounds, field-bred Pointers have the widest range of any pointing breed. Some dogs will adapt their range to their situation and have been known to work closer when the owner starts walking or ranges further out when he mounts a horse. It is recommended to purchase a started dog, especially for beginners, so that it is known how far or close the dog will work. Pointers have outstanding noses. This breed covers a lot of ground quickly, so must be able to scent any birds in the area. Breeders emphasize the ability to scent when choosing their matings. Show bred dogs tend to hunt closer than field bred dogs. They also have more natural retrieving instinct in comparison to the field bred dogs. The Pointer is not suited for water work, although they will swim out, if encouraged early, and retrieve a bird. As they don’t have a lot of coat or body fat, this breed is not one that should be taken into the duck blind. He also has too much energy to sit quietly. English Setter – The temperament of the English Setter makes it an ideal fireside companion. The breed is affectionate, gentle, and eager to please. Even the high-energy field type mellows quickly when allowed to share the boss’s quarters on a regular basis. A “medium” maturing dog, if the trainer goes slowly and doesn’t use a lot of pressure, they will have a broke dog with plenty of style by the time the dog is around two. Since this breed is a soft, eager-to-please breed, harsh training is not recommended. They respond better to positive training, picking things up easily and retaining what they have been taught. This breed is good for both close grouse work or a few can display all age range. Most have shooting dog range. Like the Pointer, they learn to adapt their distance when their owner grabs a shotgun or mounts a horse. Pointing style varies between the FDSB and AKC field trial dogs, and the AKC show and FDSB grouse type. They may or may not be a natural retriever, but can be force-broken. They will take to the water, but are not good when it is cold, and do not make very good duck dogs. Irish Setter – The Irish Setter is like the land where he comes from, affectionate, devoted to family, proud, courageous, curious, energetic and of course, impish. They are family oriented and are good with kids. This breed is good with people and other dogs. They prefer to work with their owner, are easy to train, and like the English Setter, are good at retention. Contrary to common opinion, the Irish Setter can still succeed in the field, as a close range dog or as a wider ranging dog. Many will work close to their owners all day, but can also have the endurance to do well in the three-hour heat in an all age horseback trial. As with the English Setter, they can retrieve naturally but some are not interested. They can retrieve in the water, but are not suitable for a cold-weather duck dog. Gordon Setter – The Gordon Setter is true to his Scottish heritage. He is a one-family dog, affectionate with his family members, but aloof to the rest of the world. He is happiest when around his family, and while he can live in a kennel for short periods, he will not bond as well to the family so may be more difficult to train. Of the previous breeds, he is the best watchdog and is more territorial. The Gordon Setter is a slow maturing dog, sometimes taking at least 2 years or more to reach maturity. In training, if the dog appears confused, he is not ready for what the trainer is teaching him, but when he is ready, he will grasp it quickly and retain it with few repetitions. Although he was first imported to work with grouse and woodcock, over the years different lines have been developed to be big running dogs as well as medium wide. According the Jim Basham, the classic Gordon Setter hunts quite close, from 20-60 yards ahead of the owner, but that there are also some strains that do well in the horseback field trials. Like the previous breeds, they are adaptable to what the owner is hunting at the time. Likewise, some are natural retrievers and others may be force-trained. While willing and able to swim to retrieve a downed bird, they also do not do well in cold weather and do not make good duck dogs. Taken from James B. Spencer’s book, Point! Training the All-Seasons Birddog, published by Alpine Publications, Inc. This entry was posted in Sporting Dogs and tagged bird dogs, bird hunting dogs, chooing pointing dog, choosing a birddog, choosing your hunting dog, choosing your pointing dog, comparison of pointing dog breeds, differences in pointing breeds, English Setter, Gordon Setter, hunting dog, Irish Setter, Irish Setters, Pointers, pointers and birdwork, pointing bird dogs, pointing breeds, pointing dog breeds, pointing dogs, pointing instinct, popular pointing breeds. Bookmark the permalink.